Instagram Rolls Out Redesigned Direct: Instagram launched a new Instagram Direct that makes it “fast and easy to turn any conversation into a visual conversation with photos and videos.” All texts, uploads, and reshares sent in Direct will now appear in the same thread with disappearing photos and videos, which allows users to “seamlessly go back and forth with [their] friends.” Disappearing images and videos will be highlighted in blue in the inbox, where they can be viewed and replayed once. The new Direct is now rolling out to all iOS and Android users with the updated versions of the Instagram app. Snapchat Releases New Location-based Ad Product: Snapchat released Snap to Store, “a new location-based product that lets businesses see whether people go to stores after seeing [their] advertisements.” With this new ad product, advertisers can access a dashboard that shows “the number of people who go to a store within one week of seeing one of Snap’s vertical-oriented mobile ads.” The dashboard also reveals the number of Snapchat users who visited a specific retail location; their demographic information such as age, gender, and region; and which Snapchat lens or geofilter they used. Adweek reports that Snap plans to integrate more interest categories such as music, sports, or “department store shopper” for grouping users in the near future. Facebook Adds Call-to-action Units to Instant Articles: Facebook rolled out a new feature that allows all publishers to add Page Like and Email Sign-Up call-to-action units to their instant articles. Along with providing “a simple, self-serve creation flow” for setting up these new call-to-action units directly from a page, Facebook also offers access to performance insights and opportunities to help “identify and develop new call-to-action units” in the future. Facebook added the ability for all Instant Article publishers to include Page Like and Email Sign-Up call-to-action units. Facebook will continue to collaborate with partners to discover more opportunities to “extend the business value of Instant Articles.” It’s currently testing other call-to-action units such as the ability to sign up for a free trial to a publisher’s digital subscription or install a mobile app from within an instant article. 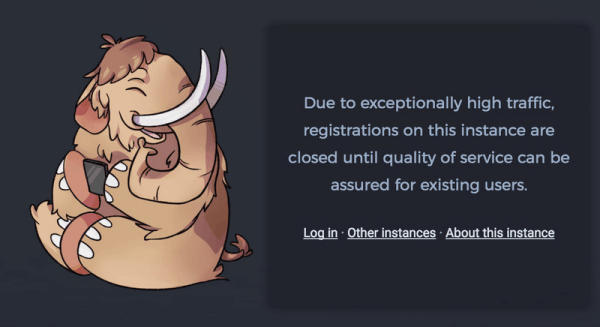 New Open-source Social Platform Mastodon Competes With Twitter: Mastodon is a new open-source social media platform that launched six months ago and is “growing like crazy,” such that new signups had to be shut down “until [the] quality of service can be assured for existing users.” The Verge reports that Mastodon has a similar look and feel to Twitter’s original chronological and public timelines but with some “key differences.” For example, Mastodon posts can have up to 500 characters rather than being limited to only 140 and users have the option to make individual posts private. The Verge also offers a beginner’s guide that offers “everything you need to know” about Mastodon’s new service. Mastodon is a new open-source “Twitter clone” that launched six months ago and is growing like crazy. In this week’s show from Friday, April 14, 2017, Erik Fisher and guests discuss the top news in social media. 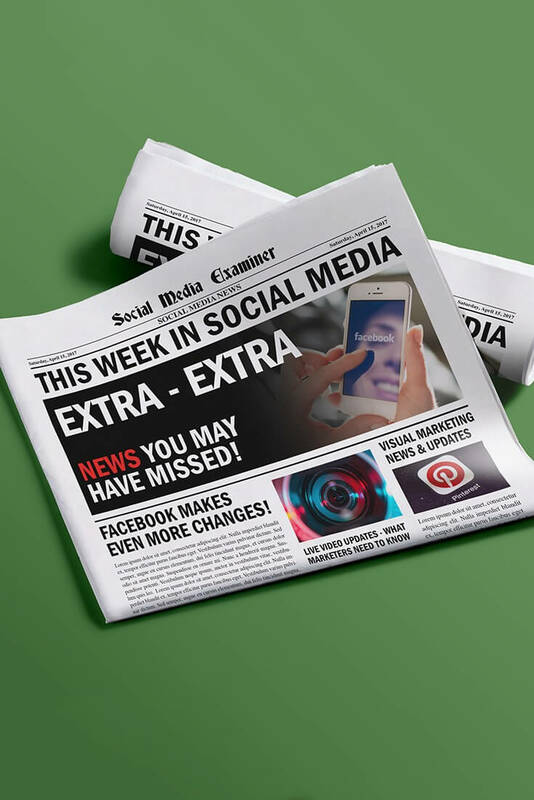 Topics include updates to Instagram (2:14), call-to-action units in Facebook Instant Articles (20:40), and new tools and functionality for Facebook Messenger (33:39). Subscribe to future shows here. Google Makes Fashion Image Searches More Like Pinterest: Google introduced two new features called “Style Ideas” and “Similar Items” to the Google app for Android and mobile web for fashion image searches. Much like Pinterest’s visual search technology, Google’s new Style Ideas surfaces “a grid of inspirational lifestyle images and outfits that showcase how the product can be worn in real life.” In addition, Google also provides mobile shoppers with “an expanded carousel for ‘similar items’ while searching for apparel products… right from Image Search.” Both of these new image search features are available globally but are currently limited to apparel and accessory searches on mobile browsers and the Android Google Search app. However, Google plans to expand this technology to more platforms and product categories in the coming year. 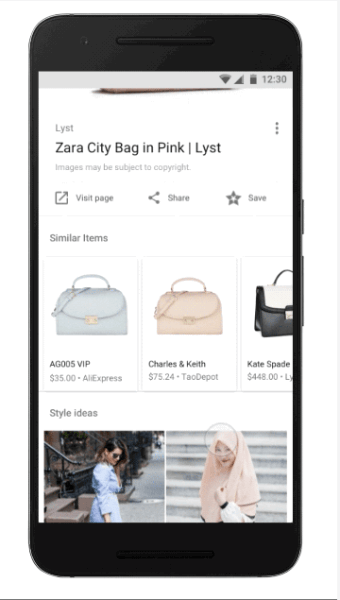 Google introduced Style Ideas and Similar Items to the Google app for Android and mobile web for fashion image searches. 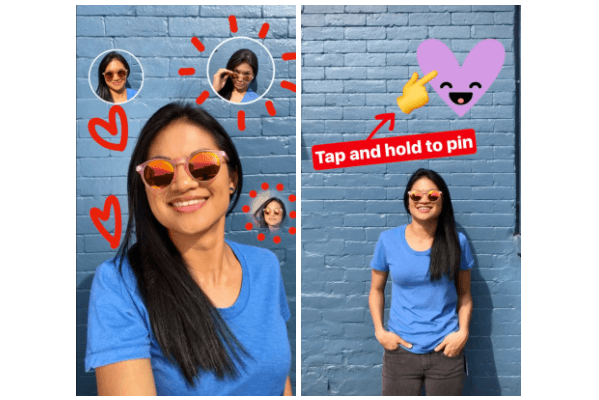 Instagram Stories Surpasses 200 Million Daily Active Users and Adds New Stickers: Instagram announced that “over 200 million people now use Instagram Stories every day” and introduced new sticker tools that give its users “even more ways to turn [their] most casual, everyday moments into something fun to share.” Instagram rolled out a new feature it calls Pinning, which allows users to convert any photo or text into a sticker for their Instagram Stories videos or images, even a selfie. Users can “pin” these stickers to a moving object in their videos. Instagram also rolled out geostickers for four new cities: Chicago, London, Madrid, and Tokyo, as well as “shortcuts to your favorite stickers” and countdown timer in hands-free mode. Instagram rolled out a new feature it calls Pinning, which allows users to convert any photo or text into a sticker for their Instagram Stories videos or images, even a selfie. 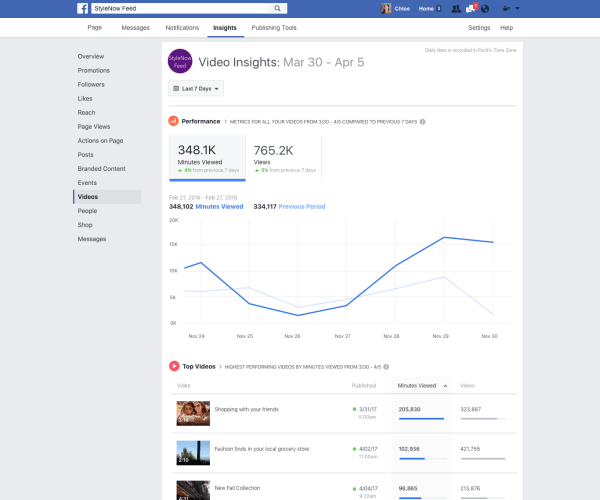 Facebook Improves Video Metrics in Page Insights: Facebook rolled out “a number of improvements” to video metrics in Page Insights such as the ability to see minutes viewed across all videos on a page and a simplified interface that only includes aggregations for 3-second video views. With this update, publishers can also easily customize how videos are ranked, analyze metrics across a specific date range, and compare current video metrics against historical benchmarks. Facebook rolled out a number of improvements to video metrics in Page Insights such as the ability to track minutes viewed across all videos on a page. 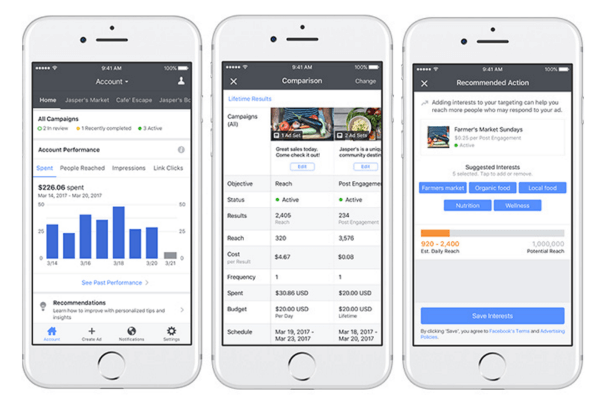 Facebook launched new tools, optimizations, and resources for Ads Manager on mobile. Twitter Expands Third-party Measurement Partnerships: This week, Twitter announced “multiple new relationships with industry-leading third-party measurement providers that enable marketers to measure the reach of their video ad campaigns” including Moat and Integral Ad Science. Twitter also announced plans to expand its existing relationships with Nielsen and comScore, which track whether Twitter ads are being delivered to the right audiences. Twitter announced multiple new relationships with industry-leading third-party measurement providers that enable marketers to measure the reach of their video ad campaigns. Facebook Messenger Rolls Out Group Payments: Facebook announced that users can now “send or receive money between groups of people on Messenger.” This new feature offers a “free, simple, fast and secure” way to seamlessly coordinate payment within a new or existing group conversation in Messenger. It will also show who has paid and full-screen details about the request. 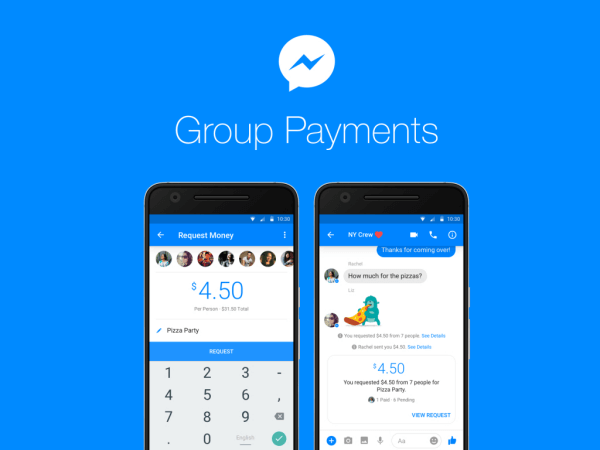 Group payments are currently only available in the U.S.
Facebook users can now send or receive money between groups of people on Messenger. Facebook Messenger Reached a New Milestone: Facebook’s head of Messenger David Marcus announced on his personal profile that there are currently “over 1.2 billion people actively using Messenger every month.” TechCrunch reports that this represents growth of over 200 million users since July 2016 and “worldwide iOS and Android downloads of Facebook Messenger grew 5.66% from 145.3 million in Q1 2016 to 153.5M in Q1 2017.” TechCrunch also shares that Facebook Messenger is “working to become more than just the most popular SMS replacement in the Western world… by copying what’s working elsewhere.” For example, Messenger incorporated the popular Snapchat Stories functionality and features into Messenger Day; added video calling; expanded uses for M, its AI-driven assistant; and more over the past few months. 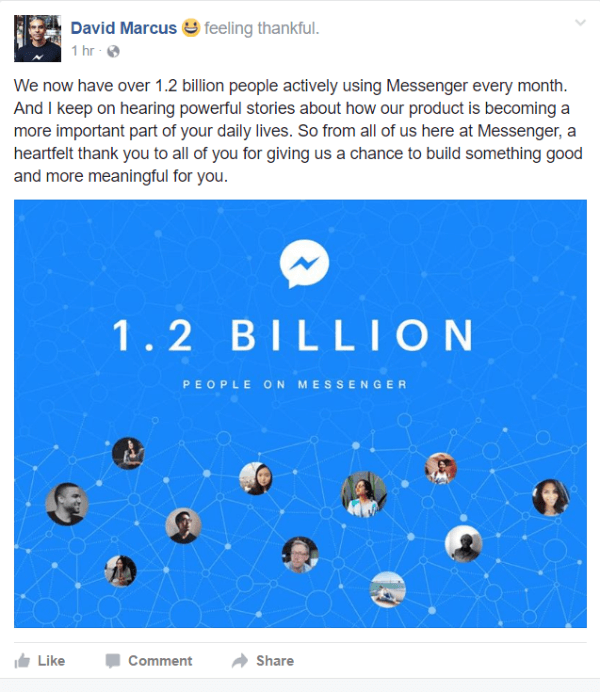 Facebook revealed that there are currently over 1.2 billion people actively using Messenger every month. Facebook Introduces Stand-alone Web Version of Moments: Facebook rolled out a stand-alone web version of Moments that accesses online albums that have been previously shared with friends. TechCrunch reports that like the “stripped-down” version of Moments within Facebook, the stand-alone web version lacks commenting or favoriting buttons or the ability to create new albums, edit existing albums, or share albums with friends. The web version is simply “a way for people who don’t have the Moments app installed… to view the photos [others are] sharing with them” through the mobile app. Facebook confirmed that the web version of Moments is currently available but didn’t share any future plans or other details about it. 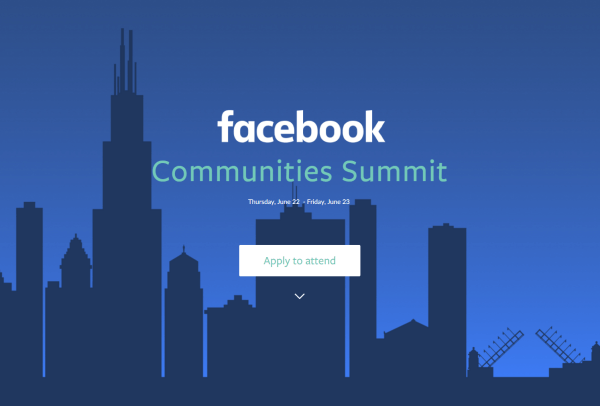 Facebook will host the first-ever Facebook Communities Summit on June 22 and 23 in Chicago. Why Businesses Should Perform Social Listening: 2017 Survey: Clutch surveyed 300 users of social listening tools at medium and large U.S. B2C and B2B companies to examine “why businesses listen online, what they listen to, and where they listen.” The results reveal that companies primarily use social listening tools to enhance customer relations by monitoring customer requests, questions, and concerns (86%). The report also states that companies use these tools to track their competition (77%) or other brands and products (75%). The studies also explored the benefit of using social listening to manage brand reputation, improve products, and monitor influencers and compare the most popular social media platforms for listening. comScore OTT Intelligence: According to new data from comScore, over half (53%) of U.S. WiFi-connected households are now using at least one over-the-top (OTT) streaming service, with Netflix being the primary choice for 75% of OTT households. However, YouTube is a swiftly growing competitor, accounting for 53% of those surveyed. Other services such as Amazon and Hulu trailed behind. For 25% of OTT households that did not subscribe to Netflix, YouTube and Twitch led all other services with 30% of this audience. 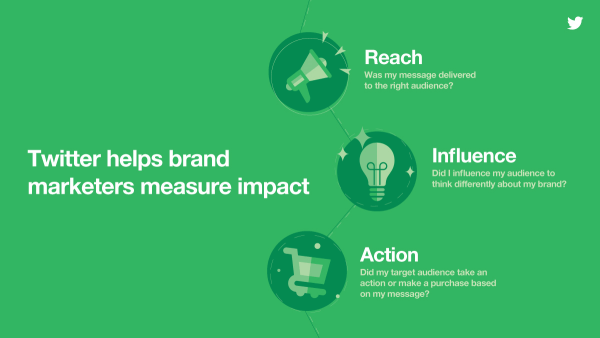 Does Your Brand’s Social Influence Strategy Go Beyond Social Media? : A “new and extensive” Engagement Labs study conducted over the course of a year with over 500 brands revealed there’s only a “modest correlation” between social media and offline word-of-mouth conversions. Furthermore, such correlations are “too infrequent to be relied upon” and are “near zero when it comes to other important metrics such as sentiment, sharing of branded content, or engagement by influencers.” The research suggests that marketers ought to look beyond social media conversions when measuring brand performance and separately foster both online and offline social sharing and recommendations. What do you think of Instagram Direct’s redesign? 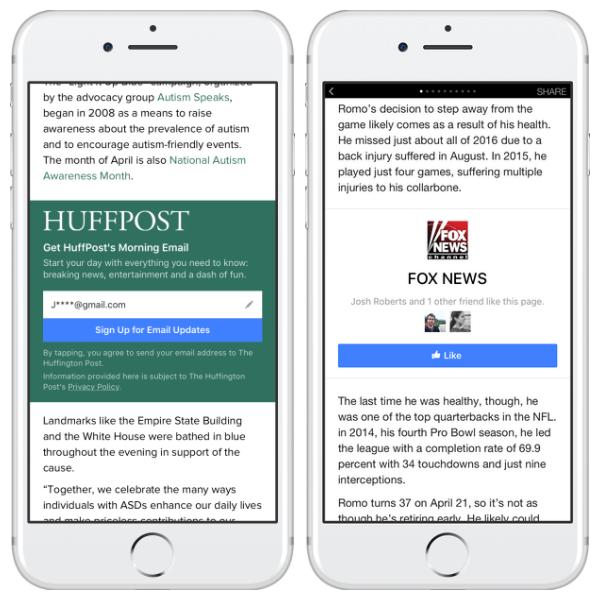 Have you seen the new call-to-action units in Facebook Instant Articles? Please share your comments below. Instagram Direct Streamlined and other social media news for Apr. 15, 2017.